There is no shortage of pizza options in Columbus but there is an absolute dearth of deep dish pizza of any quality grade. In the past I opined that only three were worth mentioning: Meister’s, Wholly Joe’s and Tristanos. As much as I love Meister’s, I had a very slight preference for Tristanos. Last year word came out that Lou Tristano had finally sold his business. It was long overdue, Lou makes great food but is/was a threat to himself and his employees operating a food based business. I was sad to lose Lou and in my opinion (whether deep dish or not), one of the best pizza makers in Central Ohio. I then saw hints of a salvage operation by Yellow Brick Pizza to learn some of his Chicago based secrets of Lou before he passed the pizza peel to others. Facebook showed traces of Lou teaching Yellow Brickers how to make some of his recipes and by report the learning curve was looking good. I don’t know when or if Yellow Brick may open a Grove City satellite in Tristanos old spot but when I saw they were offering Tristano’s Deep Dish as a special in Old Town East I knew I had an obligation to observe, investigate and act. I also think highly of Yellow Brick so I believed the Tristano’s legacy to be in good hands. A few things you should consider before you do your own research. You can not pre-order this pizza. It will take at least 40 minutes to make – more if the place is remotely busy and a two topping Deep Dish pizza will knock you back $31.18. The waiting is not such a bad thing, because it means someone is making it right. In order to be to objective as possible, I asked two research assistants to try a slice with me (after I fed them other pizza so hunger pangs would not influence their thoughts). Rated it a solid 4 (on a scale of 5) noting: good crust and sauce that really complimented the spice in the sausage and a great cheese to toppings ratio. Easily one of the best Chicago pies I’ve had in Columbus in recent memory. Also in the team was Mister Doctor who opined: Good pie Jefe. I also brought a slice home to Mrs. Gourmand, while my two on site research assistants had never tried Tristanos, Mrs. Gourmand shared every Tristanos experience with me during my brief exile in Grove City. Her opinion was that it was good but she could detect significant differences in the sauce. Mrs. Gourmand is Italian and makes superior sauce. She also has an olfactory sense unparalleled by any other human. She can smell things that even my dog would miss. If she sniffed this out as not quite the original I will accept that as gospel. Now for my assessment. The visual presentation of the deep dish was on par with Tristanos. 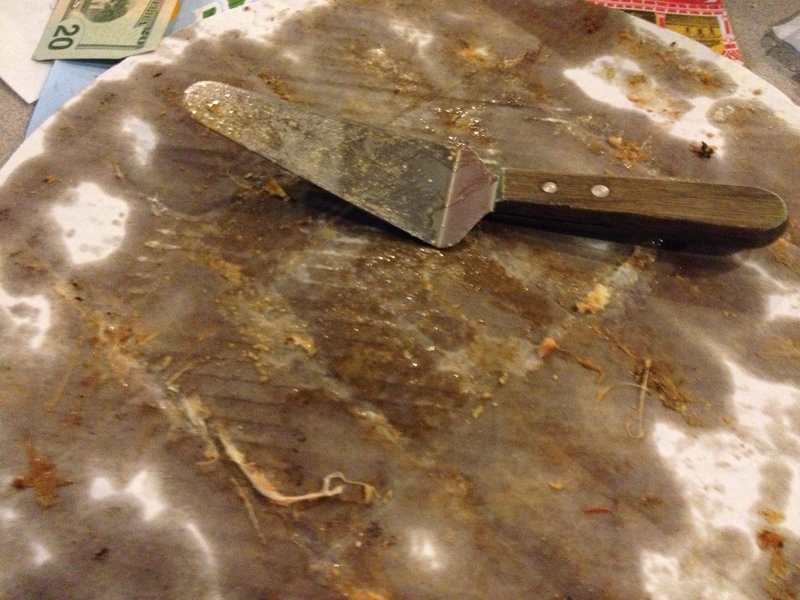 The slices were thick and pie like. There was a signature recurring twist in the crust ring and a foldover filled with a trace of cheese in the crust as it rises from the bottom to the top. The pepperoni were laid out in thick rows between the crust and the cheese. The pie was significantly cheesy with evidence of such presented below. Assessing flavor, taste, etc., based on a pizza recipe I had not had sampled in almost a year is tough but based on my memory I’d say the Yellow Brick interpretation of Tristanos is about 91% on target. Mulling over the experience for 24 hours, I believe part of the difference I noted was due to the toppings I chose. Lou made his own sausage which added a trace of spice to the mix that I doubt could be replicated by anyone else. I also tried a slice of pizza the next day using the time-tested cold pizza test. That slice was also assessed be a very good pizza. In recap, using subjective and objective methods as well as a team of tasters, I proclaim the Yellow Brick Tristano’s Deep Dish Pizza one of the top three of its type in Central Ohio. The Buffet Battle Series begins with Pizza. Each buffet listed is available Monday to Friday 11 am to 2 pm or close to it. Three buffets were tested rigorously and these are the results. Ratings are on a 5 point scale. Since Pizza is the primary food at each spot, it gets an added criteria for this installment of the series. Ange’s has a long history in Columbus dating back to 1953 and it might surprise readers in that there are 8 locations. I’m not sure if all locations offer a buffet or if there are differences in buffets at the different sites. If there are let me know. The buffet here is fairly barebones – one or two pizzas, a cut up stromboli and a small metal bowl with a salad mix and packets of salad dressing on the side. Staff interaction is minimal. The eating area is small and cafeteria like with minimal seating and devoid of any atmosphere or character. The buffet also includes a beverage via styrofoam cup. The sign says the buffet is $7.49 after tax the total price is $8.03. This location is hard to find buried behind a Panera in a strip mall that is hard to enter and exit. This seems to effect the number of people who try the buffet and thus may effect the volume of items offered and subdue any staff excitement about the buffet. Massey’s is also a long time player in Columbus pizza, the original owners were among a small group of early pizza pioneers in Columbus. Massey’s grew into a large empire which collapsed and has been rebuilding in the last decade. I was surprised to see there are eleven local locations as well as one in South Carolina. This is one of the oldest Massey’s locations and is smaller and more austere than most of the new sites. This buffet included a variety of pizzas, a pasta dish (spaghetti), a mixed salad, a pasta salad, small slices of subs all served via styrofoam plate with a beverage in a styrofoam cup for 7.99. Here you pay first when entering and then eat away. Although the site is busy with carry out orders the staff do make an effort to keep the food stations filled. The eating area is low on ambiance with several small beat up tables and chairs. It is also noisy from a TV and the acoustics of an old building. My favorite items were the small sections of bite size cut subs, perfectly cooked with great flavor, I went back more often for these than the pizza. While Massey’s tag line is the Cadillac of pizzas, Iacono’s has earned that moniker for their buffet. Two years ago it was $8.75, until 6 weeks ago it was $9.75 now that we are firmly in 2016 it is now $10.77. That price may scare off some but the value is hard to beat. The buffet features a full salad bar including a variety of house made dressings, cottage cheese, pudding, macaroni salad, potato salad and bacon bits, home made soup, two to three full pizzas which are typically served in half styles so a total of 6 varieties are usually available. The staff often ask what type of pizza you like and typically you will see that as a new selection while you are eating. A dessert pizza (a mix of apples and cinnamon). A beverage is included and staff are aggressive in making sure your cup is not half empty. The space is large with many tables and some half booth / table seating along one wall. There are several high chairs available and if you need to find a place far from the madding crowd, you can find it. The in house music is not overly loud and typically features the best of the 1970’s. While this buffet is the most expensive, you definitely get what you pay for and for this the whole is as great as the sum of the parts….and the pizza. And thus ends the first Buffet Battle, Iaconos wins. Reviewing the extensive archives of CMH Gourmand, I find a few references to Hounddogs but nothing extensive. Of course there is a brief listing in the Slice of CMH section of the blog and back in 2012, there was the Nerd Night Clintonville Pizza Challenge, but that is it. That is an oversight on my part so I’m going to fix that. I have always been a fan of Hounddogs but I have become even more of a loyalist over the last year. 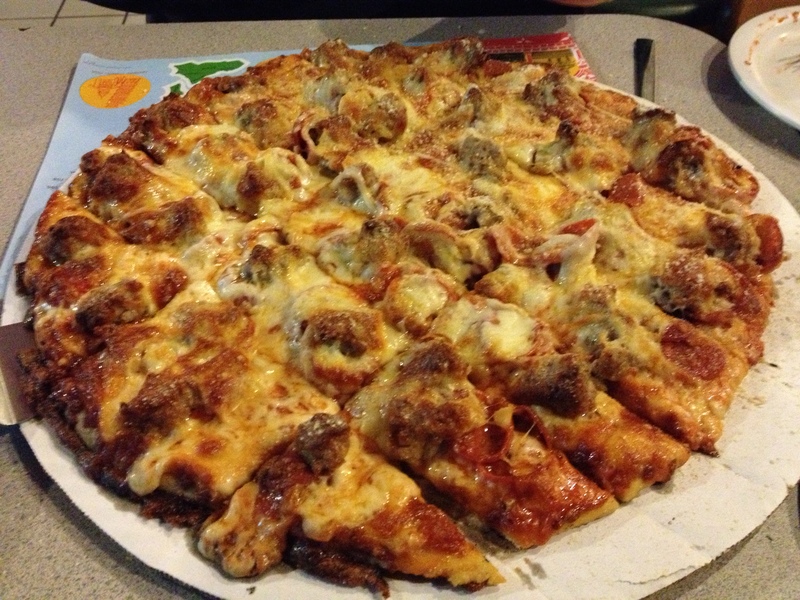 I lead a tour of four of the best pizza places on the city with Hounddogs as one of the stops. There is a big change of perspective when one shifts from a fan to a pizza docent focusing on what is great about a place. Over the past year, I have learned much more about a business I have patronized for over 20 years and it spite of that, I still feel I have more layers to peel off of the onion that is this pizza place. Ultimately, what makes Hounddogs stand out from the pack is variety. It starts with the crust, there are three to choose from: Thin crust, Smokin Joe’s style (a thick garlic butter crust right paired with a mild, sweet sauce) and a Gluten free crust. All are good, but the people (Hounddogs is “pizza for the people”) go with Smokin’ Joe’s style 70% of the time. Then there is the sauce, well, make that sauces, the five choices: pesto, Joe’s (mild, sweet), regular, spicy, and howlin’ hot. There are also some interesting speciality pizzas to choose from in case all of the options available make creating your own, overwhelming. Three speciality pies that pop out to me are: The hot mama, pesto pie and BBQ chicken. The hot mama combines smoked, sliced Cajun hot links, ham and bacon with sauerkraut. Yes, sauerkraut, think of this as a Reuben with pizza sauce and it works. The pesto pie is a vegetarian pie that is a carnivore’s delight. There are mounds of provolone, mozzarella, tomatoes, black olives and feta cheese over pesto sauce on thin crust. The BBQ Chicken pizza begins with a spicy garlic BBQ sauce with chicken, red onions, bacon and cheddar cheese. I could go on, but then I would be giving the tour away for free. There are so many stories in the place from the murals on the wall to the beer cans collections in the bar. There is a lot to look at in between bites. However two recent changes are true game changers for the business. First, the iconic black limo that was used for deliveries was finally sent the the scrap year after sitting in the back lot for years. It could not be repaired and they need the parking spaces. The good news is the Hounddog mounted on top was removed and may appear on another classic car for delivery in the future. Most importantly, 24/7 service has ended. 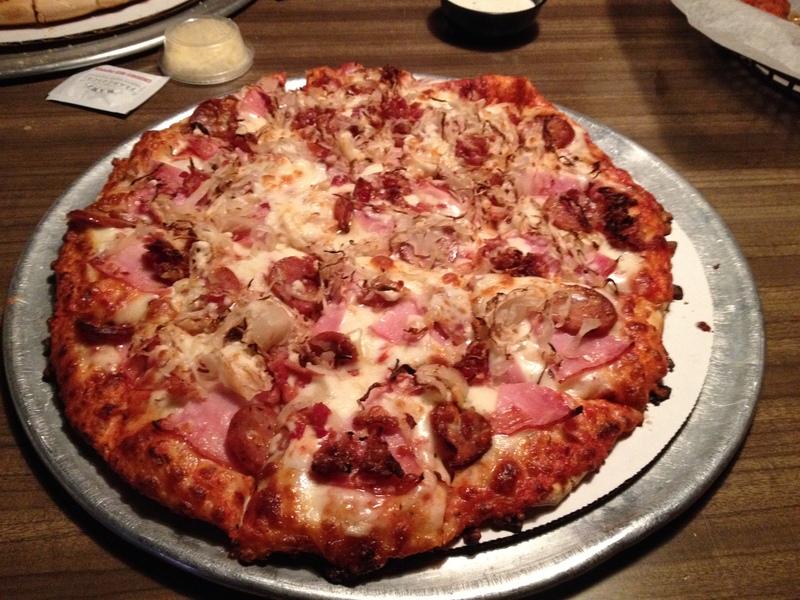 Hounddogs made a name for itself and kept it by being a 24 hour pizza place since 1992. That changed January of 2015. 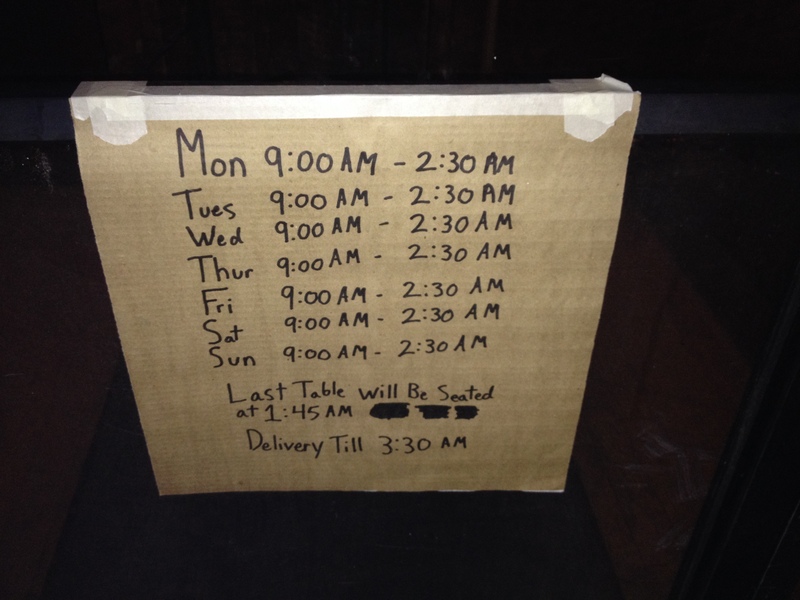 I have posted a photo of the new hours below. While the place has always been a destination for an eclectic mix of guests, the new hours and other changes have made it a destination for families over the last year or so. If you have not visited here since college or before 4 am, you may want to drop in and reacquaint yourself with pizza for the people. The far east side is a bit of a wasteland when it comes to destination dining. There is no lack of choices, there are plenty of chains to choose from but nothing exceptional comes to mind when I mentally walk through my options for that quadrant of town. Years ago, I had friends who lived in Pickerington and the far, far east end of Broad Street. 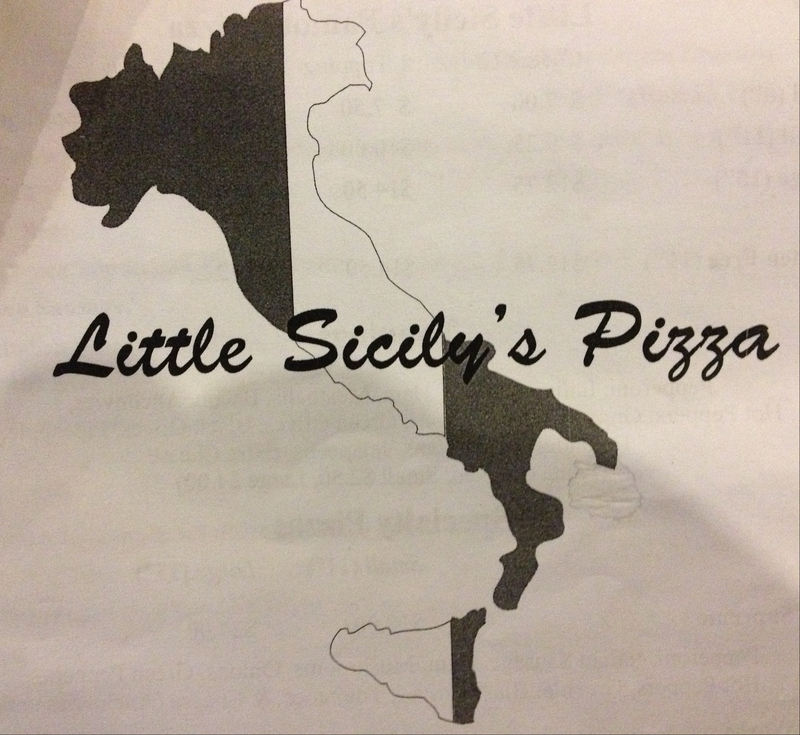 One was in town for the holidays and when we were looking at options to meet up, he suggested Little Sicily’s Pizza. I had forgotten about this place. In days past, Little Sicily’s was consistently in my top ten list. I had their pizza countless times as carry out while visiting friends. I’d never dined in before and it had been years so I was ready to rediscover the place. Little Sicily’s is tucked in a very modest building near the intersection of Brice and Refugee Roads. It was so busy, I was unable to find parking and had to get creative to secure a suitable spot nearby. The inside is as unassuming as the outside, there are a few simple tables, some nick knacks on the walls with a few TV’s mixed in. All of the customers were long time regulars who the servers knew by name. The menu is streamlined with a few choices: pizzas, sandwiches, salads, spaghetti with meatballs and lasagna. The only surprise on the menu was a gluten-free crust option. I wish I could elaborate more about the food but the only combination I have ever had is a large pizza with pepperoni, sausage and extra cheese. The extra cheese option makes for some serious thickness and weight. The sausage is thick and chunky. The pepperoni’s are liberally applied on top and sometimes layered on top of each other 2 to 3 slices deep. 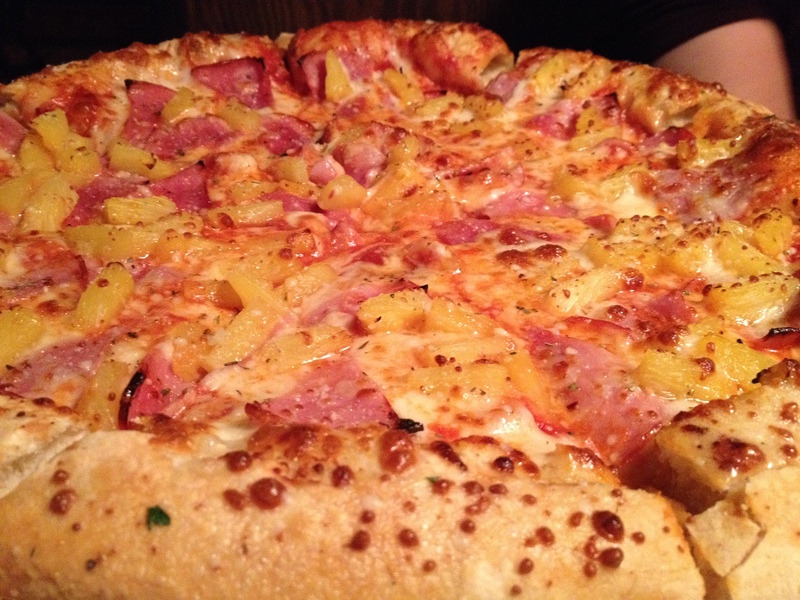 The crust and sauce are non-descript but serve as a suitable delivery method for the toppings. Little Sicily’s has been an institution in Brice since 1975 and exceeds the expectations of a typical neighborhood pizza joint. I typically avoid the Brice Road area with a vengeance but if I was within 15 minutes of Little Sicily’s, I would be strongly tempted to call in an order. The tagline on the menu is “The Pizza Worth The Drive” and from my observations, it looks like a lot of people make that choice.